July 2016 will marked the 9th year of our “Safe & Sober Summer” campaign. 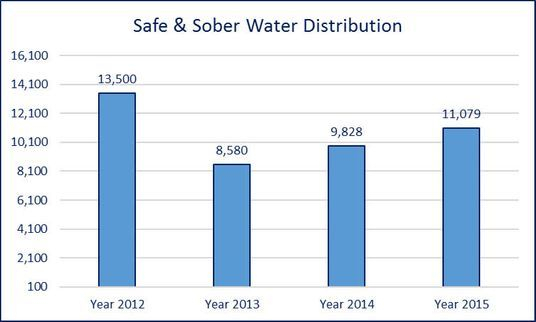 In 2015 we gave out over 11,000 bottles of water, a significant increase from 2014. Our efforts allowed us an opportunity to promote a safe, sober summer and provided us with the opportunity to educate people on the dangers of using alcohol. We shared facts that over 85% of all violent crimes are committed while under the influence of alcohol or drugs. Our hopes are that in giving a bottle of cold water, we may divert potential alcohol induced violent behavior. By partnering with Southern California Cease Fire Committee, together we can help to save lives. We are seeking monetary and/or product donations. Additionally, the Center for Disease Control (CDC) has stated that alcohol abuse and hot weather can trigger violent behavior. As a result we will be distributing bottled water in various communities throughout Los Angeles County and surrounding cities from July 10, 2016 to August 28, 2016. The Southern California Cease Fire Committee is a non-profit organization that volunteers its time and money to better our communities. We are in need of donors who can contribute their time, funding and/or product donations to help make this campaign successful. Want to make a monetary or product donation? Thank you for your support! Remember, all donations are tax deductible.